I would have never thought that if I came to NYC, I would get married, be an American citizen and buy a house. I have dreamt about coming to the USA since I was 5. As a child I would play a game with my friends called the “ World” in Albania. Each of us would choose a country that we wanted to be and I always choose to be the USA. Buying a house on our own was a dream that once it became a reality, we found ourselves in search of a way to decorate it and make it our dream house. As much as it is fun and interesting and pushes us further to be more creative, very often we found ourselves stuck and running out of ideas. In this moment, we changed and moved things around. By moving the couch 180 degrees and on the opposite side of the living room, we ran the Tibetan carpet, given by our very best friends Ken and Tracey (which, by the way I miss her very much). Next we started to incorporate our antique pieces we have bought during these past years and things stared to come together. We still have far to go but it will be fun finding those special pieces at antique markets over time. Our place, as most of the houses in Brooklyn, has character. In both the living room and our bedroom there is a chimney. We can use them if we wanted, but for the moment they are just decorative. We thought it would be a great idea if we put a mantle over both of them and so we looked for some old, rustic barn wood that would match with our décor. We went to one of our favorite stores in Greenpoint, Brooklyn, Brooklyn Curated, a place we go to search for different types of wood, cool stuff and ideas for design. It is a small, local store that has great character. I do hope that it will stay around for little while. It will be sad if this store closes as we have seen many other stores closed down because of skyrocketing rent. Go and check Brooklyn Curated if you love old, vintage, cool and unique ideas. With that idea in mind, we got the mantle. The wood is a large beam of Spruce that was cut in half to make two pieces. Greg had to plane the wood so it was flat and while sanding it, the Spruce gave off a wonderful smell. We then cleaned them and applied Hemp Oil that he bought from Miss Mustard seed to give a deep look and try to revive the color of the wood. The Hemp Oil penetrates and protects from the inside out it will offer up a water-resistant, protective and beautiful finish. 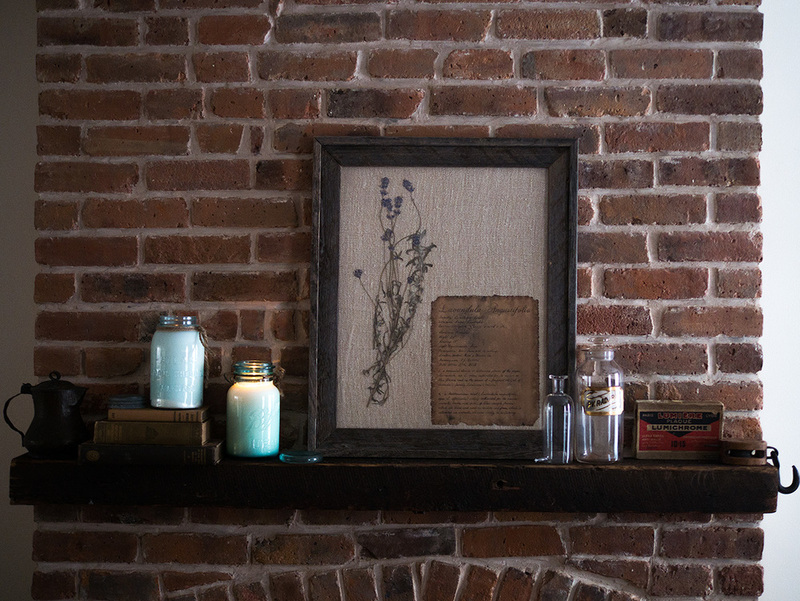 We decorated the mantle with this beautifully framed dried lavender we got from Greg’s parents garden in French burlap we bought in France using a rustic barn wood picture frame. It is a beautiful piece of work, so unique and totally matches our mood and the atmosphere of the living room. Greg very carefully hand wrote, using an old pen, a little story about where we got the lavender from; the year it was picked and how lavender is our favorite plant that will always be in our garden and kitchen. He then deckled the edges and soaked it in a tray of coffee overnight to age the paper. It is well known by now that candles are part of me and so they always will be on my mind when I am decorating the house, so I put these two beautiful candles using the vintage mason jars that I bought a while ago. The candle on the books has a fragrance of Green Tea and Lemongrass and the other one is a Honey Suckle and Jasmine. My favorite place is the living room, sitting on the couch by the chimney and taking in light smell of both candles as they fill the air. Mason Jars are my favorite and I will be adding more candles on my site very soon. My brother bought this antique pot for us in Kruja, a city in Albania. Each time I see it reminds me of my family. This is the mantle in our bedroom. The camera in the photo is the one Greg used to shoot the photos from his Coney Island Lost series. I am not a fan of a big bouquet of flowers, but I do love to have flowers in these little bottles that we buy in flea markets. The whole place feels so different and so warm. I will talk more about our place and how we decorate it slowly with the new stuff we bought from tag sale or flea markets through years. If you want to learn about the struggles of buying a place in Brooklyn check out Greg's post, TIPS ON BUYING A HOUSE IN BROOKLYN PART 2. Greg and I have a dream that one day will have our own store where we will be able to sell furniture we restored or painted and add something unique to the world of the design. What is your dream? Maybe yours is to win the lottery and travel throughout Europe…let us know what your dreams may look like.